I'm so excited to launch my creative brand design services! Click here to learn more about how we can help your business have a gorgeous and effective brand identity. This is a conceptual full brand design for Vintage Beauty Bar. I started out with a mood board to fully crystallize the vision for the brand identity design, and to find cohesive elements. A mood board is an essential starting point for creative brand and logo design - it helps you form your vision and gives us a starting point. Don't worry - you don't have to design the mood board yourself! Your homework is to work on a Pinterest board of images that you love, and we pull those into a mood board for you. 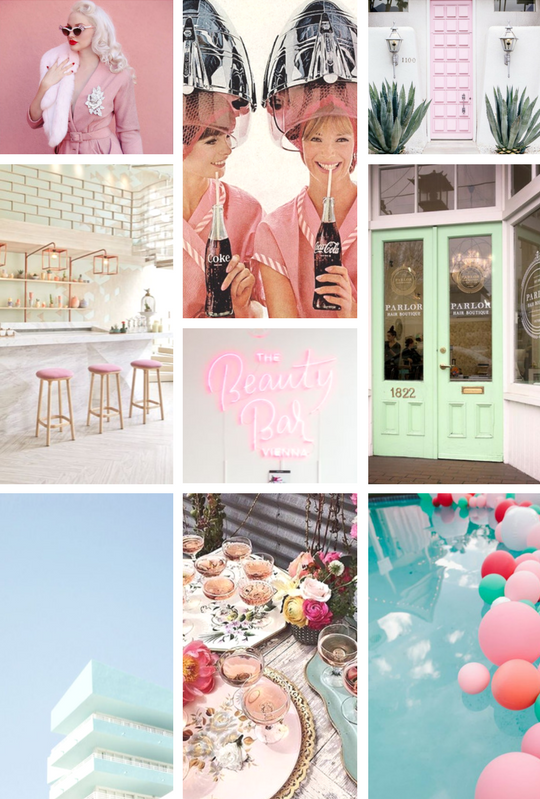 A mood board is also helpful for you to keep on hand as you plan your social media strategy: you can choose content that is in line with your brand's mood board. Once the mood board is completed, we start on the logo design. The color and design element inspirations for this project were a vintage beauty salon with an updated feel. The color palette included a feminine pink and Art-Deco-inspired hues of blue and green. Our packages usually include an initial design, then two revisions. For Vintage Beauty Bar we did a full brand board and brand design, including a service menu and business card design. I hand-illustrated the logo of the woman with hair rollers, as well as the icons included in the logo. We always include fonts for our clients to use, as well as a brand guide to educate our clients on how to best use the brand identity elements. For this project, we also designed a service menu and business card. We used the fonts and brand elements in these two collateral pieces to keep the brand identity cohesive. If you're ready to get started on your own custom brand design please email us at hello@bonniebryantcreative.com!